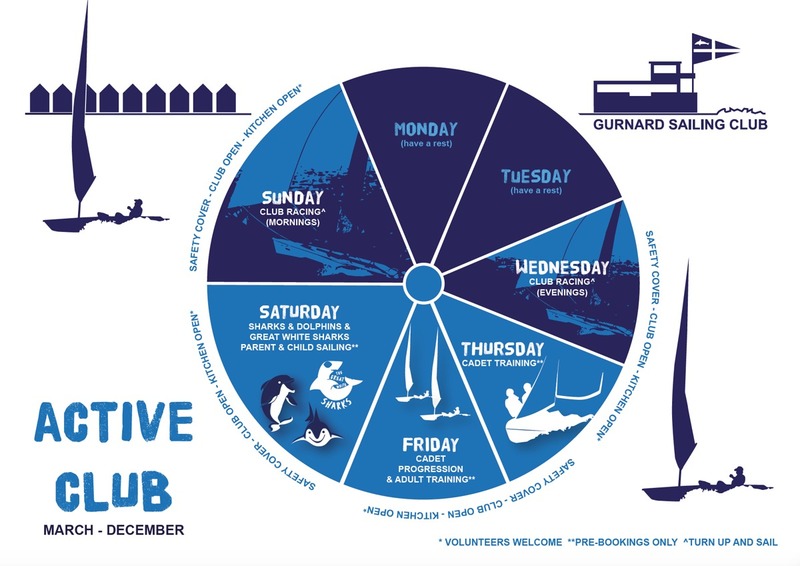 Established in 1931, Gurnard Sailing Club is the Island’s premier Dinghy Club with around 600 members. We offer high quality dinghy racing in Gurnard Bay and the Western Solent. The club house is open from 0900-1400 on a Sunday and 1800-2100 on a Wednesday during the sailing season. It is also open at other times when a sailing event is scheduled. The club’s focus is dinghy racing. This takes place on Sunday mornings (March-December) and Wednesday evenings (May-September). Racing is organised into a number of class or handicap fleets. Racing starts at 1030 on a Sunday and 1830 (or slightly earlier when the nights draw in) on a Wednesday. Racing is competitive but sailors of all abilities are warmly welcome and actively encouraged to join in. If you are new to dinghy racing, please speak to any club officer or more experienced club racer and they will be pleased to show you the ropes. The club is a RYA recognised training centre. Training for cadet members (aged 16 and under) is offered on Thursday and Friday evenings from May to July. Cadets train on a Thursday evening at RYA levels 2, 3, 4 and start racing while more experienced cadets undertake advanced courses on Friday nights. Many of our older cadets assist with these sessions. Courses for adult beginners and race training are offered at certain times in the year. More details on the training pages. The club offers RYA Powerboat courses. Participants must be aged 13 or over (16 or over for Safety Boat courses). A RYA Assistant Sailing Instructor course is also run once a year. A RYA first aid course is also possible. A Family session on Saturday mornings for sailing parents to get together and take their children on the water in a safe and fun environment. Children aged 5 years and above are welcome. A number of fun sailing events are held throughout the year including picnic races and informal training sessions. Dates for these events are on the calendar. The Island of Wight Dinghy Championships is the highlight of our sailing program and comprises racing for different classes an handicap fleets over a weekend. Competitors come from Island and mainland clubs to race in a challenging but fun event. More details can be found on the website. The club hosts open meetings for dinghies such as Shadows, RS500s, RS400s and RS100s. Other, sailing events such as a Pico regatta and a Laser competition are also arranged. All members are encouraged to join in. There are boat sites available for club members over several compounds beside the club and at Gurnard Marsh. Slots are allocated at the beginning of the year to regular sailors, cadets and then to those who sail less regularly. A waiting list operates if the club compound is full. Boatsite application forms are available from the members area. The sailing club owns a small number of Laser Picos, RS Feva and RS Teras. These are available for competent sailing members to hire during sessions which have safety boat cover. More information and hire forms are available from the race box. Please note that the race box and club officials may accept or refuse a hire at their discretion. The general running of the club rests with the General Committee which meets regularly. Chaired by the Commodore, this committee comprises all flag officers, executive officers and other club members.The General Committee minutes are available to club members. The club is run entirely by volunteers with the sole exception of a paid cleaner. Volunteers run the committees, undertake the administration, man the safety boats, run the bar and kitchen and organise all the sailing and non-sailing events. This keeps down costs but also encourages an all-inclusive, family atmosphere. All members are expected to volunteer for a number of duties each year and this is a great way to get to know others. The club is run by volunteers and all adult club members that are able to are expected to take part in the duty rota. More information on duties can be found here. To sign up for a duty please go to the members area. A copy of the club constitution is available here. Please take a few minutes to look through it. The club arranges a number of social events for members throughout the year such as suppers, quiz evenings and dances. Details are posted on the notice boards, website and social media.